This release from Disc Le Roi features Elvis at the end of tour 21. From this tour we already have two bootlegs with good sound, Old Times They Are Not Forgotten and Southbound, from Tuscaloosa August 30 and Macon August 31 respectively. About the concert - well, there is not much too say... It is Elvis at his most perfunctory. All in a day's work and it sounds! That said, 'See See Rider' really gives great vibes! Elvis is otherwise quite tired in his voice, and he also forgets the lyrics here and there...."It's been a long day", Elvis says during the seconds attempt on 'Mystery Train/Tiger Man'. On the first attempt Elvis mixed the opening words of the song and stops it immediately. During the concert Elvis talks a lot and the tempo is rather slow. Still, for the first row members of the audience it most likely was a nice concert. It sounds like Elvis gives his attention to several girls in the Von Braun Civic Center in Huntsville this evening. Especially "granny" demands a lot of attention, which makes Elvis say "Not you again, granny" later in the show. This is one of the first times Elvis has Shaun (Sherril) Nielsen sing 'Danny Boy'. A nice performance, but quite different from the 1977 - versions. The total running time is almost 75 minutes! You will not be blown away by this release, but it is recommended after all. 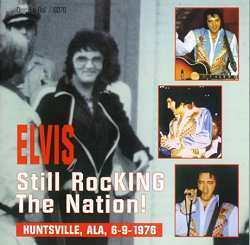 Please go to Elvis in Summer 1976 for more about this tour and others tours in 1976.